Convert your car to disc brakes without having to change your spindles or lower your vehicle. This kit bolts right onto your existing spindle for a quick and hassle free installation. Works with most 15" wheels. 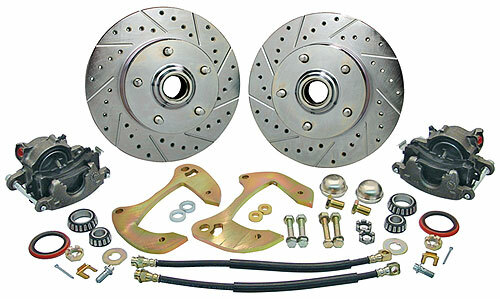 Kit includes: disc brake bracket kit, rotors, loaded calipers, bearings, seals, dust caps, spindle nuts and hoses. *Shown with optional upgraded rotors.